Cats spend a heck of a lot of time lounging -- at least mine do. 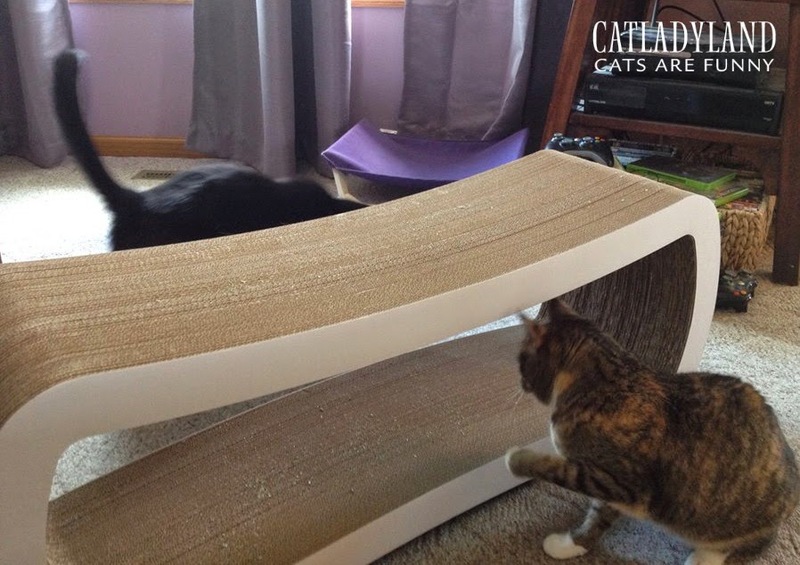 When PetFusion asked if we'd like to try one of their new Jumbo Scratcher Lounges, I knew Saffy, Cosmo and Phoebe would be all over it. I'd definitely be a hero. Plus I knew it would arrive in a large box, which would exponentially increase my heroism in their eyes. So the day arrived when the Jumbo Scratcher Lounge appeared on our doorstep. Oh, happy day! The cats gathered 'round, their curiosity piqued in a jumbo way. 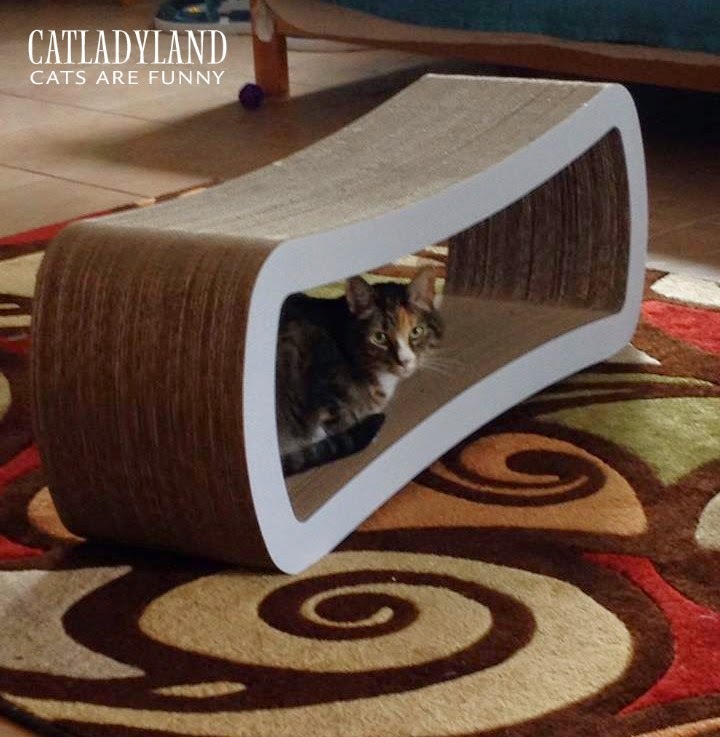 I pulled the Scratcher Lounge from the long box and waited for the cats' eyes to widen. 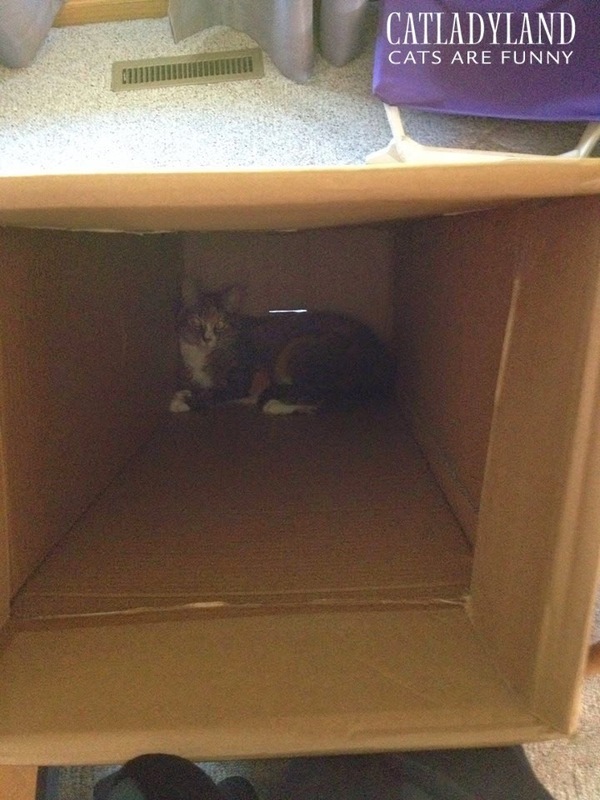 They widened, alright -- and Phoebe immediately occupied the tunnel-like box. 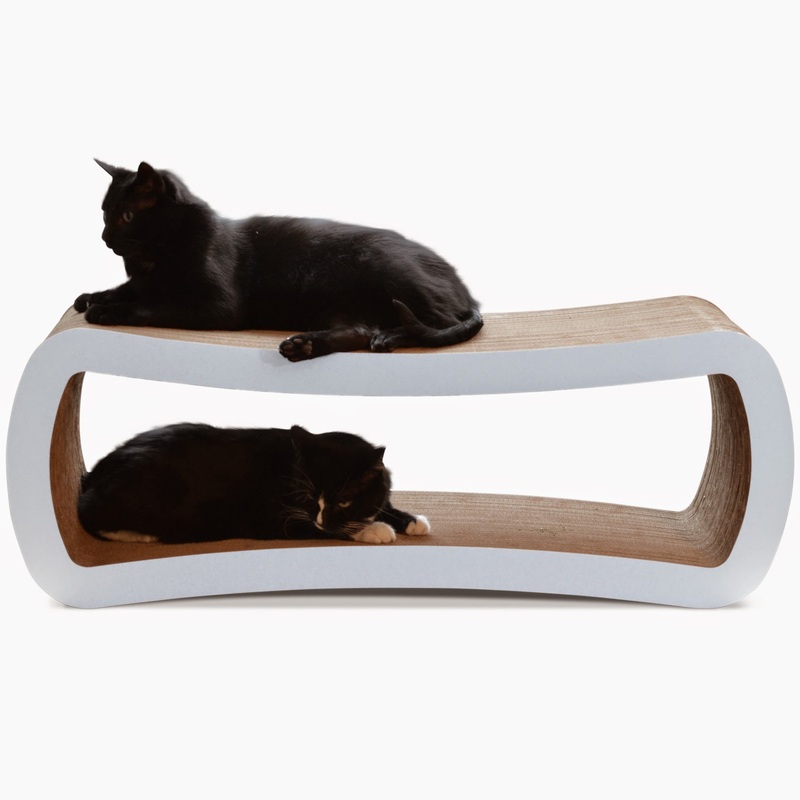 The Scratcher Lounge is a solid, well-constructed item, made of eco-friendly, recycled and recyclable corrugated cardboard and nontoxic, corn-starch glue. I saw it was clearly a quality product, and I couldn't wait to see what my cats would think of it. I moved the Jumbo Scratcher between a few places around the house, and waited. Each time I checked to see if one of my three had discovered it, I only saw Phoebe -- and she was definitely pleased. I sprinkled catnip on the surfaces and brought the other cats over, but they didn't stay long. You see, Phoebe had already claimed it as her very own, and heaven help the cat who tried to use it alongside her. I witnessed her swatting and hissing at Cosmo and Saffy if they came anywhere near it. One of the reasons I wanted to try the Jumbo Scratcher is because I have three cats, and it's, well, jumbo-sized. 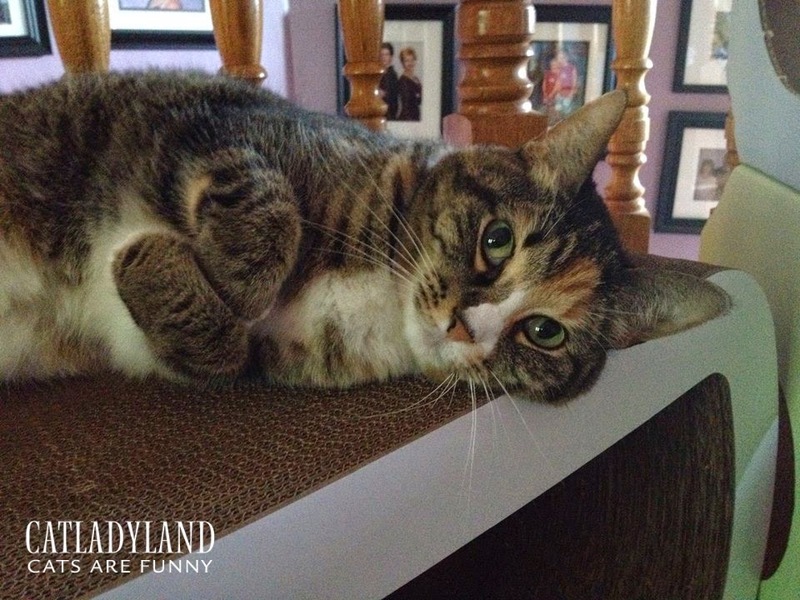 Kitties can lounge or scratch on the top or inside, which also serves as a cool hideaway. What wound up happening was my tiny Phoebe, the smallest of my brood, became Queen of the Jumbo Scratcher Lounge. I wish I could report on how my other cats reacted to the awesomeness of it; however, that opportunity hasn't yet presented itself. I can say, however, Phoebe loves it. I mean, she absolutely adores it. She sleeps on the top, cozies up on the bottom and scratches all over it. It's a great scratcher -- I just found one of her claw sheaths beside it, so it's pretty sturdy. Don't I look adorable when I lounge? So, I highly recommend PetFusion's Jumbo Scratcher Lounger, and Phoebe gives it her seal of approval. I imagine it would be a major hit in homes where cats actually share spaces. You can check out all of PetFusions awesome products here. The Jumbo Scratcher Lounger is one of three new scratchers. 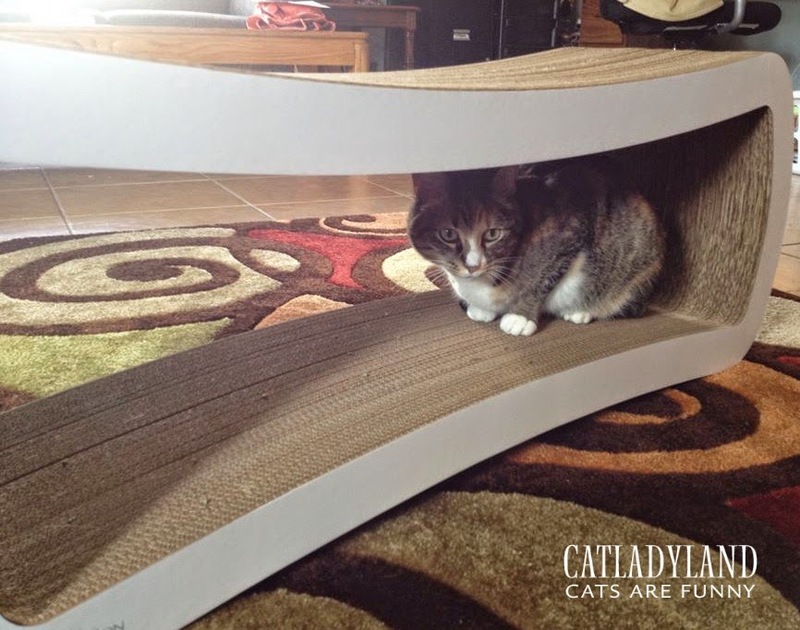 The 3-Sided Vertical Scratcher and Reversible Curve Scratcher are also new additions to their line of quality cat products. This post is sponsored by PetFusion. I was given free product to review, but Catladyland only shares information and products we feel are relevant to our readers. PetFusion is not responsible for the content of this article.